From planning and promotion to execution and follow-up, great events require a killer strategy with a heaping dose of tenacity to pull off. Those who do it well seem superhuman, with powers we mere normals do not possess. Never fear; a social media event plan is here. Social superpowers … activate. Once you have a confirmed date and location, start promoting your event through social media — even if you haven’t finalized all the details. 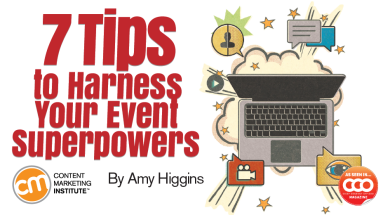 Dash out of the gate – As soon as possible, spread buzz about your event. 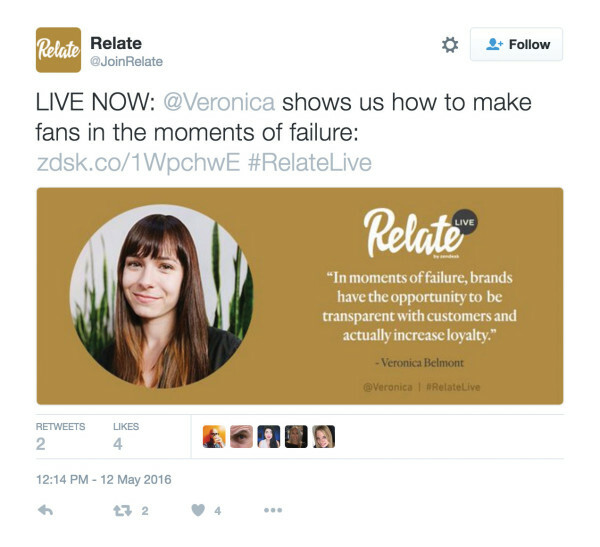 Develop social posts that include speakers, sponsors, and influencers to help increase reach. Involve your employees – Don’t forget to create excitement among your closest stakeholders. Even better, arm them with tools to help with promotion. Make it easy for your co-workers to share the event by writing social posts for them. Share this via any internal communication tool — internal newsletter, Slack thread, Yammer channel, or even an email. Create a promotion-code plan – Invite your influencers by sharing a promotion code. The earlier you get them involved, the sooner they can help you promote your event. Pro tip: Always use a visual to promote your event, and be sure to hit up speakers, sponsors, and influencers via social to take advantage of their networks. You engage speakers to provide original insights on the day of your event, but don’t forget they are also powerful allies to promote the big day. Design shareable speaker cards – Ask a designer to develop a shareable social media graphic that includes room for a headshot, quote, and brief event details. Ask the speaker for a quote (or even better, script one based on the presentation deck). Share speaker quotes – Use your speaker quote visual to promote the event and the speaker’s session. When you share the image, don’t forget to ping your speakers and their companies. Reuse speaker cards often – Use your new graphics in all sorts of ways, from featuring them on speaker pages, tweeting visuals during the event, or even creating a SlideShare presentation of all speaker quotes. You could even do collectible, limited-edition T-shirts if budget allows. Don’t let speakers hog all the fun. Consider reaching out to high-value attendees to generate excitement and amplify your message. Seek influencers among attendees – As RSVPs roll in, examine social profiles to find out if you’ve attracted influencers to your event (usually someone with over 1,000 followers). Then begin a conversation with those individuals, asking for a chance to meet IRL for a one-on-one conversation at the event. This kind of outreach can help you build a strong, lasting relationship with your influencers and their networks. Share the love – Don’t let your social channels be all about you. Curate your influencers’ content to help create a diverse and interesting social feed for all to enjoy. Conduct pre-event interviews – Reach out to your attendees directly for interviews. Ask them simple questions about the event that others might be asking themselves. (You can publish the interview in a blog or even a podcast.) Why are they attending the event? Is this their first time attending? What are they looking forward to the most? Which session are they looking forward to? Do they have a conference crush on anyone? (OK, just kidding on that last one.) The goal is to create awareness about your event and increase reach by using attendees’ networks. 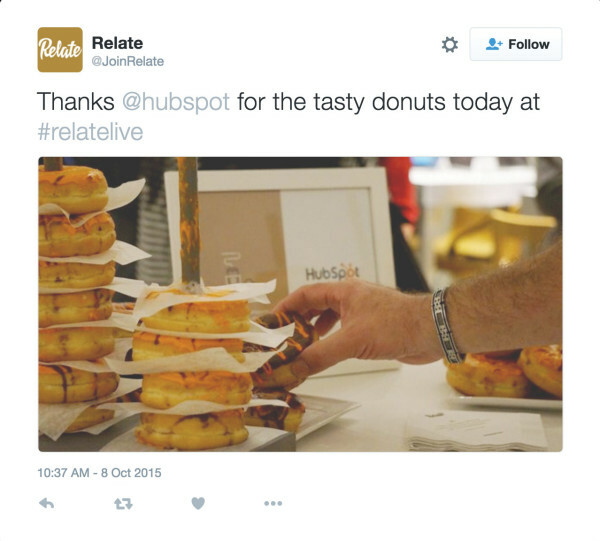 Hashtags help users track conversations. Done well, they convene people with shared interests and foster online dialogue. Yet too few marketers take advantage of their full potential — particularly for events. To get the most out of your hashtag, treat it like a long-term asset, juicing it for all it’s worth before, during, and after the event. Research whether any other hashtags in use sound similar – Do this every year, not just the first year you create it. Hashtag misfires abound. I worked at an organization that used the same hashtag each year until it suddenly was co-opted by a furry convention. Yes, those furries. I repeat, research your hashtag anew each year. Test your choice – Evaluate it among a small group to ensure that it is memorable and doesn’t cause confusion. And steer clear of complicated acronyms or odd spelling choices. 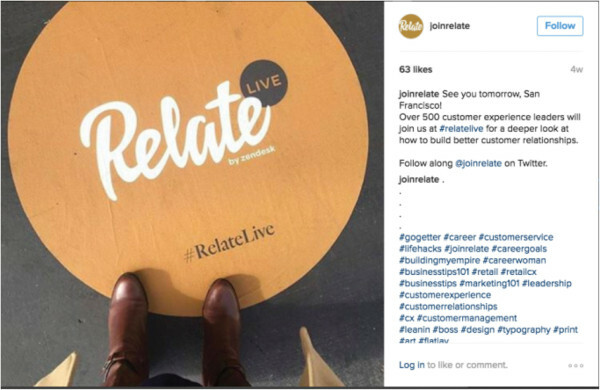 Use it early and often – Incorporate the hashtag on all promotional materials, presentation deck templates, and every other spot you can think of. Think of it as your rallying cry. Attendees will learn about your event through a multitude of channels — website, blogs, email marketing, retargeting, social media, and even word of mouth. The trick is to engage with them as soon as possible so that they know where to find you. Open a channel – When attendees register, send them something via social that might be of interest to them, and only them. If you notice they are coming from out of town, share a local landmark they may want to visit. (Since I have #bacon on my Twitter profile, I’ve had event organizers recommend where to eat bacon close to the event’s location.) By acknowledging them, you help create an open dialogue that will last well beyond the event. Banter before the big day – Even beyond the first touchpoint, keep the conversation going, particularly as the big day nears (e.g., What session are you looking forward to?). Pro tip: Request a Twitter handle on your registration form so you can reach out to attendees via social. Depending on the level of excitement about your event, you may be able to host a mini-event (or three) before the main show. Organize a Twitter chat – Really get social by organizing Twitter chats with attendees before the event. Use an influencer as your speaker to help draw in more chat attendees. Help attendees connect for pre-event socials – When SXSW was in its early days, a few of us would get together to compare session notes and travel plans. People are always looking for smaller events before the main events. Companies can use this to their advantage by hosting small pre-event happy-hour days (or weeks if you have a big local contingent) before an event. Need budget for them? Ask your sponsors. This will increase their sponsor value and reach. Cultivate a partnership – Go beyond the basics of sticking your sponsors’ logos on your website and carving out a spot for them at the event. Expand the partnership by mentioning your sponsors on social media. Let your audience know why you are excited to partner with each and every one of your sponsors. The goal here is to get your sponsors to retweet and share posts about your event — helping to increase your reach. Appreciate them – Go beyond the traditional nod at the podium. Share a thank-you slide showcasing all sponsors with a link to the event. Share photos of gifts/swag at the event. Ask for quotes to share. With these simple strategical tactics, you can create the conversation about your event well before the main event takes place. This article originally appeared in the October issue of Chief Content Officer. Sign up to receive your free subscription to our bimonthly print magazine. Amy Higgins is the strategic account manager at TopRank Marketing. Follow her @AmyWHiggins.